Easter Services will be busy, so please try to arrive early. You may arrive before the previous Mass has ended. We will have lines forming at each of the entrances, so please dress appropriately for the weather since it might be cold. Have you, your children, or even your grandchildren celebrated a spiritual milestone here at St. Paul of the Cross? Perhaps it was(or soon will be) a wedding, or a baptism, or first Holy Communion, or Confirmation, or a graduation from our wonderful parish school? We hope you will join us as we gather to celebrate the most important liturgies of our Catholic faith and the summit of the Liturgical Year. All liturgies will take place in the Upper Church unless indicated otherwise. On the weekend of October 14, 2018, Parish Finance Council presented a renewed effort to increase regular Sunday giving for St. Paul of the Cross. The goal being better fiscal management by lessening our reliance on unplanned items such as bequests to balance annual results. St. Paul of the Cross is a thriving parish by several measures. We have a long and diverse list of parish ministries, our Religious Education program has over 1,200 students. Our school’s enrollment is currently above 550 students and our preschool and kindergarten are continuing to grow. During Fr. Britto Berchman’s tenure, 1,500 new families have joined and we are one of the largest parishes in the Archdiocese. We have a large, well-maintained campus and facilities. In response to some of the difficult news Catholics everywhere have been dealing with recently, the parishioners of SPC want to show our priests how much this community loves and appreciates all that they do and the good shepherds that they are to our parish family. All St. Paul of the Cross volunteers over the age of 18 must complete training that is mandated by the Archdiocesan Office for the Protection of Children and Youth. The Illinois Tax Credit Scholarship Program, “Invest in Kids,” provides a 75 percent Illinois state income tax credit to individuals and corporations that contribute money to a non-profit Scholarship Granting Organization (SGO). The SGOs award scholarships to eligible students from low-income families. Donors will use money already owed to the state (taxes) and donate it to a needs-based scholarships instead, all while receiving a 75 percent state tax credit. In 2000, under the leadership of Pastor Fr. Carl Morello, St. Paul established the Parish Educational Endowment Fund. The goal of the fund is to help keep tuition as low as possible making Catholic education available to all families and to provide scholarships to well deserving and students in need and to assist with other educational needs of the parish. The fund began with a $10,000 donation from the school walk-a-thon fundraiser. The fund’s initial goal was to reach 1 million dollars and, until that goal was met, no monies were spent. All the best Catholic Content. All in one place. We are pleased to offer FORMED.org, which provides parishioners free access to catechism programs, feature films, Catholic ebooks, audio presentations, and much more! Catechesis certification will soon be available! The parish priest and staff at St. Paul of the Cross Church are committed to making a welcoming place for you and your family to worship. St. Paul of the Cross is a vibrant Catholic Community located North of Chicago. We have two worship spaces that are used on weekends - the upper church & Holy Family Chapel. Staying connected to your faith and your parish is easier than ever with our new mobile app! Download today in the app store! Our church is located in Park Ridge, IL on the corner of Northwest Highway and Washington Avenue. Park Ridge is 15 miles Northwest of Chicago and 10 minutes from O’Hare Airport. We are two blocks from the Union Pacific Northwest Metra Stop and one block from Downtown Park Ridge shops and restaurants. The main parking lot entrance is off of Washington Avenue & Northwest Highway. Additional parking is available in the small lot on Ridge Terrace next to our Kinane Center. There is a handicap accessible ramp and elevator that is easily accessible from our small parking lot. The entrance to our small parking lot is through the alley, off of Summit Avenue. The Perpetual Eucharistic Adoration Chapel is open to everyone seven days a week, twenty-four hours a day. 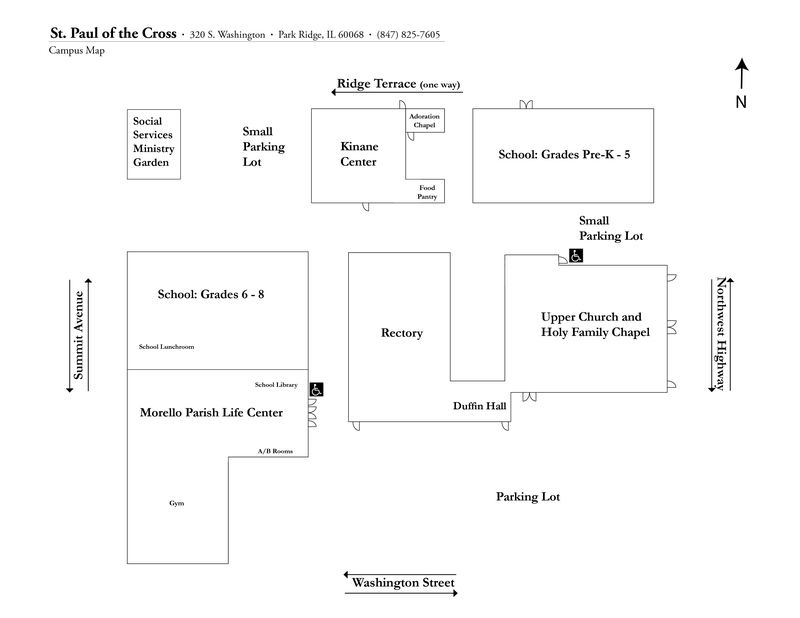 The main entrance to the Adoration Chapel is located at 215 Ridge Terrace off of Northwest Highway. After 9 p.m. a code is required to enter. Hosted by Fr. Britto this 30-minute radio show attempts to help listeners fashion their marriages and romantic relationships using the best insights of marriage experts while leading them to build solidly on the Rock that is Christ. The show uses wisdom from psychology, the well-tested insights of experts, real life experiences of couples, and the well-considered observations of priests. There is healthy doses of humor and at all times all our discussions are firmly rooted in our faith. Built on the Rock airs on Relevant Radio the first Thursday of each month 9:30 - 10 a.m. Listen to show archives now!